New Orleans, US -- Hundreds of kilograms of oily debris on beaches, declining seafood catches, and other troubling signs point towards an ecosystem in crisis in the wake of BP's 2010 oil disaster in the Gulf of Mexico. According to Robin, entire sectors of the Louisiana oyster harvest areas are "dead or mostly dead." "I got 10 boats in my fleet and only two of them are operating, because I don't have the production to run the rest. We're nowhere near back to whole, and I can't tell you when or if it'll come back." Birren said the problems are not just with the crabs. " We've also had our grouper fishing down since the spill," she added. "We've seen fish with tar balls in their stomachs from as far down as the Florida Keys. We had a grouper with tar balls in its stomach last month. Overall, everything is down." 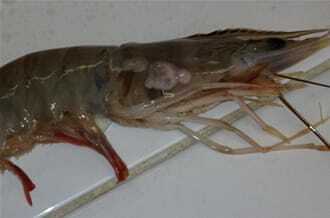 Blanchard has also seen shrimp brought in with deformities, and has taken photographs of shrimp with tumors (see above). Others lack eyes. He attributes the deformities to BP's use of toxic dispersants to sink the spilled oil.